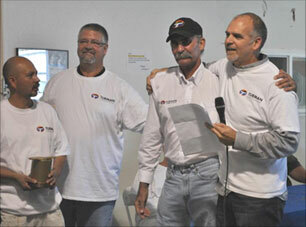 This past year Turman Commercial Painters reached a milestone only few companies can brag about - 40 years of business! What an adventure it has been! In October 1971 Ed Turman received his contractor's license for painting and E. Turman & Co. was incorporated in 1973. Ed's son-in-law Dave Theobald has been at the helm for the last twelve years. From early projects for the newly formed Webcor in the 1970's, to larger contracts for Cache Creek Casino and the Oracle headquarters in the 1980's, Turman has set and reached goals that once seemed nearly-impossible for this little painting company. In the early 1990's Turman became a merit shop and relocated to its current corporate headquarters in Livermore, California. Working on the restoration of the Sir Francis Drake Hotel in the late 1990's gave the company the confidence to dream big. It acquired Washington Commercial Painters in 2000, expanding its business up the West Coast. Landing multi-state, multi-site work created the impetus for the opening of more offices, including Oregon Commercial Painters in 2007 and additional Turman offices in Southern California, Charlotte, North Carolina, Denver, Colorado, Gahanna, Ohio and Dallas, Texas all over the last five years. Obtaining licenses or approval to do painting work in all 50 states, Turman was on its way to expansion. Even over the past few years when the economy has struggled, Turman's ability and flexibility have enabled it to land large multi-state projects as other companies, including banks and other financial institutions, merged and rebranded. Turman has remained true to its core values of being relationship driven, doing the right thing, and staying focused on excellence. Turman has gained a reputation as being an ethical business leader in the construction industry as well as in the communities in which its offices are located. In addition to painting, Turman has expanded its services to include other types of coatings, cool roofs, restoration, special finishes, wallcovering, non-electrified sign removal and installation and surveying. We are continually striving to improve our abilities, expanding our business to positively impact the construction industry and help our employees, colleagues, customers and clients reach their full personal and professional potential. We look ahead to the future and excitedly dream about the next 40 years! Welcome to the first edition of Turman Today. Our vision for this electronic newsletter is to provide you, our friends, clients, customers and suppliers, timely information about our industry, as well as our Company. Our intent is NOT to clog up your inbox with more PR material. We respect you and your time. We hope you will learn new things about what’s happening in the construction world as well as become more familiar with who we are and how we can help you reach your goals. We will include news stories, human interest stories, professional tips as well as opportunities to win fun prizes. We have used the occasion of the celebration of our milestone 40th Anniversary as the launching date for a product we have dreamed about for years. We believe you will find our colorful creation to be both informative and enjoyable. Take a look and let us know what you think. We welcome your constructive feedback to make this newsletter a useful tool. On Friday August 24th Turman Commercial Painters, along with its affiliates Washington Commercial Painters and Oregon Commercial Painters, celebrated the Company's 40th Anniversary milestone with a "Virtual BBQ." Thanks to the Company's commitment to technology and its talented IT team, each of the Company's seven locations were connected by video monitors and all Company employees throughout the country were able to see, hear and celebrate together. In Livermore, the Company's corporate headquarters, the festivities took place in the shop area where a 12 foot inflatable screen made the event larger than life. 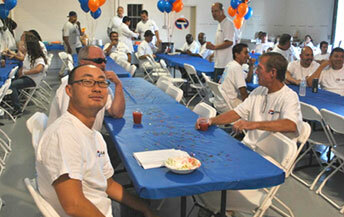 Blue and orange balloons could be seen in every office and smiles abounded as employees enjoyed lunch, slideshows, and music. Throughout the program, each office had an opportunity to tell about itself, share interesting facts about its location, and introduce its employees to their colleagues across the country. Although the office staffs regularly communicate via video monitors and the field crews often work together on traveling jobs throughout the country, this was the first time ALL employees were linked together at one time. The camaraderie was fantastic! Turman's CEO Dave Theobald addressed the troops, thanked them for their dedication, and commended them for contributing to the Company's success. He presented a slideshow chronicling the Company's growth over the 40 years and shared the future vision for the Company. He presented Service Awards to those employees who have worked for the Company for 15 years or more. Those employees recognized were Lloyd Musick (15 years), Rudilio Navarro (16 years), Jim Staggs (16 years), Sean Cadigan (20 years), Dan Escamilla (24 years), Tim Ruoff (32 years) and John Noble (33 years). The long term commitment of these employees speaks to the Company's commitment to "creating environments where people want to be." This applies both to how the Company treats its own employees, as well as its clients and customers. Turman's Virtual BBQ was definitely a first for the Company. But it was an event soundly enjoyed by all and likely has become its own tradition in the making. • Add a tablespoon of vanilla extract to a gallon of paint to cut the smell. 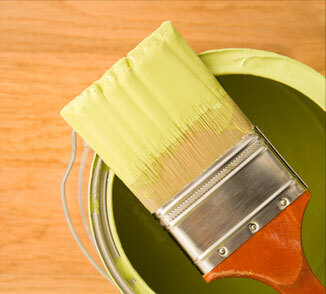 • Add household ammonia to paint on a HOT day to make the paint flow out better. • Use a cheater pad instead of rollers when doing a clear finish on stained doors. This will eliminate roller hair in the finish coat. See all of our the associations & certifications here.